Cor ad cor loquitur -- heart speaks to heart. That’s the motto Cardinal John Henry Newman chose for his coat of arms when he was given the red hat. Some 130 years later, it’s the theme of Pope Benedict XVI’s Apostolic Journey to the United Kingdom – a visit that will be highlighted by the Beatification Mass of Cardinal Newman. Salt + Light Television will bring you the Beatification, as well as all the other events surrounding the Holy Father's September 16th-19th trip. Visit our Apostolic Journey page for full broadcast details HERE. The first day begins in Scotland, and will be highlighted by a meeting with Her Majesty, Queen Elizabeth II and an open-air Mass in Glasgow. The Pontiff will travel to London for the second day and meet with Catholic educators, religious congregations, and the Archbishop of Canterbury. The day will close with an ecumenical prayer service. Saturday will be highlighted by Mass at Westminster Cathedral and a prayer vigil at Hyde Park in anticipation of Newman's beatification. 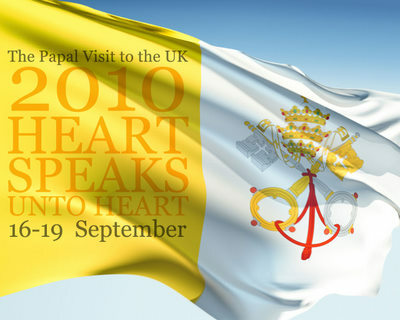 The final day of the visit consists of a meeting with Bishops in England, Scotland, and Wales and Cardinal Newman's Beatification Mass at Cofton Park, in Birmingham, England. Follow our blog in the lead up and during the trip for insight, addresses, homilies, and background information. You can also keep in touch on our Facebook page, and stream us live online here, or on your iPhone 3Gs/4G.